ATP-binding cassette (ABC) transporters comprise the largest family of primary active transporters found in all kingdoms of life. They use the free energy of ATP hydrolysis for translocation of a broad variety of solutes. Based on their general function, ABC transporters can be subdivided in importers and exporters. ABC importers are mainly found in prokaryotes for the uptake of nutrients like carbohydrates, amino acids, or vitamins. In eukaryotes, ABC exporters are localized not only in the plasma membrane but also in intracellular compartments, such as peroxisomes, lysosomes, endoplasmic reticulum, mitochondria, and chloroplasts. The spectrum of solutes transported by ABC exporters ranges from chloride ions to proteins of a size more than 100 kDa. In humans, ABC transporters take over crucial functions in cell homeostasis like iron or cholesterol metabolism, in immunity, and in detoxification. Therefore, malfunction of these transporters is associated with diseases such as cystic fibrosis, diabetes, hypercholesterolemia, adrenoleukodystrophy, macular degeneration, bare lymphocyte syndrome as well as chemo-resistance in cancer therapy. Although high-resolution structures of some ABC transporters exist, the mechanism of these machineries is still ill defined. Key questions concern the conformational states, the allosteric coupling between the single domains, the localization of substrate-binding site, the stoichiometry and kinetics of the ATP hydrolysis cycle. In the CRC 807, we aim at resolving how ABC exporters function. We will elucidate the modes of substrate binding as well as the dynamics and kinetics of substrate translocation. We focus on two human and two bacterial ABC transport complexes. The lysosomal peptide transporter ABCB9 and the E. coli lipid flippase MsbA assemble as homodimeric transporters, whereas the antigen translocation complex TAP1/2 and the lipid A transporter TmrAB of Thermus thermophilus form asymmetric, heterodimeric complexes. Structural and functional analysis of ABC export systems. A) Probing the catalytic activity of MsbA by real-time 31P MAS-MNR. Time-resolved spectra show the decrease of the ATP peak and an increase in Pi and AMP. 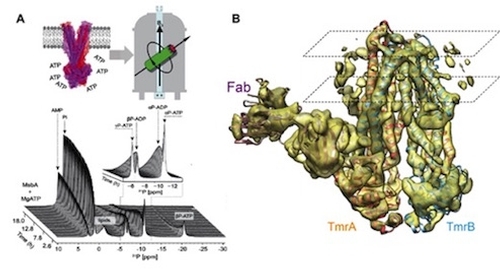 B) Cryo-EM structure (6-8 Å) of the transporter TmrAB in an asymmetric inward-open state, assisted by Fab fragments.